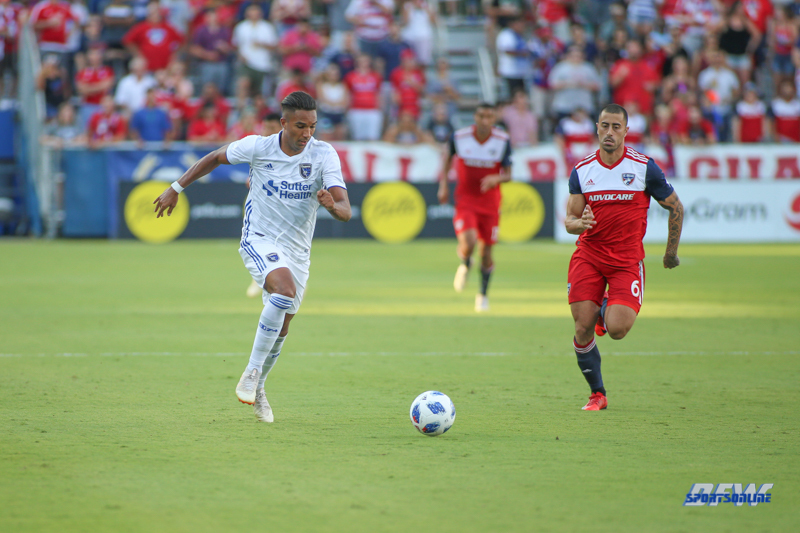 FRISCO, TEXAS – FC Dallas lost for just the fourth time in 22 matches this season, 3-1, Saturday night to the San Jose Earthquakes at Toyota Stadium. FC Dallas goalkeeper Jesse Gonzalez was called upon twice in the opening 13 minutes of the match. He made a diving save low to his right side in the sixth minute on Magnus Eriksson before going up to the top corner of the goal to punch away an attempt by Danny Hoesen. The third attempt was the charm for San Jose when Valeri Qazaishvili collected a pass out of the back from Shea Salinas. The pass was played long, up the left side in the 19th minute and Gonzalez charged far off his line to try and win the loose ball. Qazaishvili got there first and avoided the sliding tackle from Gonzalez. FC Dallas defender Matt Hedges tried to recover but Qazaishvili cut back and calmly picked out the far side netting to put the visitors in front, 1-0. FC Dallas hit back with a goal of its own in the 23rd minute. The play began with defender Reggie Cannon stepping in front of a San Jose defender to win a key 50-50 ball at the top of the area. Cannon skipped past a second defender before finding Michael Barrios, who was making an overlapping run down the right edge of the box. Barrios picked up his head and found Roland Lamah at the back post for an easy tap-in goal, the midfielder’s eighth of the season. Jahmir Hyka scored his third career goal vs. FC Dallas in his third match just after halftime. Aníbal Godoy set up the goal with a lofted ball into the area. Hyka brought down the pass and beat Gonzalez just inside the near post to make it 2-1 in the 47th minute. Once again, FC Dallas countered quickly after the San Jose goal. The team forced two saves from Earthquakes goalkeeper Andrew Tarbell in the 53rd minute. Left back Marquinhos Pedroso started the play with a cross in to the area. Tesho Akindele redirected a header on goal that Tarbell punched away but the rebound fell to Barrios on the doorstep. The Colombian tried to sneak a shot over Tarbell, who was still on his stomach, but the goalkeeper recovered to make an outstanding save with his right hand to keep the match, 2-1, in favor of San Jose. San Jose tacked on a third goal in the 88th minute when Chris Wondolowski beat two defenders near the end line and picked out Qazaishvili at the back post. Inside the six-yard box, Qazaishvili slid to push his second goal of the match over the goal line. The loss is the first for FC Dallas at Toyota Stadium in over a year. The last home loss for FCD was a 4-0 defeat to the Vancouver Whitecaps on July 29, 2017.